OVERVIEW: Don’t be a Grinch – share the holiday spirit with the $260 million box office hit: Dr. Seuss’ How the Grinch Stole Christmas!, for the first time ever on Blu-ray™ Hi-Def. Every Blu-ray™ is a great value featuring a bonus DVD of the movie! 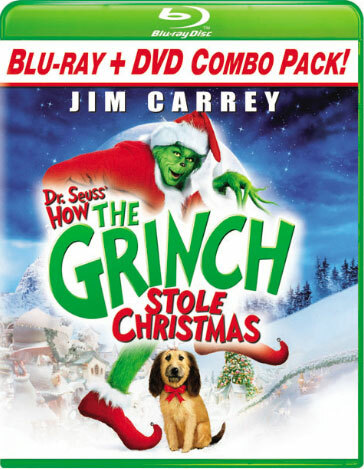 From Academy Award® winner Brian Grazer (A Beautiful Mind) and Academy Award® winner Ron Howard (The Da Vinci Code) comes the incredible re-imagining of the perennial favorite story with the astounding transformation of comic genius Jim Carrey (Yes Man) as the greedy Grinch. Also starring Taylor Momsen (“Gossip Girl”), Jeffrey Tambor (Hellboy II: The Golden Army), Christine Baranski (Mamma Mia! The Movie), Molly Shannon (“Saturday Night Live”), Bill Irwin (Across the Universe), Clint Howard (Dr. Seuss’ The Cat in the Hat), and Anthony Hopkins (The Silence of the Lambs). SYNOPSIS: From Imagine Entertainment and Universal Pictures, Dr. Seuss’ How The Grinch Stole Christmas! is the very first live-action feature of the family classic by Theodor “Dr. Seuss” Geisel. Brought to life by Producer Brian Grazer, Director and Producer Ron Howard and unforgettably played by Jim Carrey, the movie chronicles the search for the true meaning of Christmas, both for the Grinch and the Whoville characters. In terms of Special Features, the Blu-ray Disc includes basically the same featurettes released in previous edition of the film.The new features are U-Control BD Live. Similar to what Disney has being doing with its releases. The Blu-ray Special Offer Combo Pack that also includes a DVD copy of the of the film, allowing fans to own this classic story on standard def DVD while they are preparing to upgrade to 1080p Hi-def Blu-ray, so consumers can “future-proof” their collection. Includes a bonus DVD copy of the movie so you can watch it anywhere! BD-LIVE™: Access the BD-Live™ Center through your Internet-connected player to get even more content, watch the latest trailers, and more! MY SCENES SHARING: Bookmark your favorite scenes from the movie then share with your BD-Live™ buddies! WHOLIDAY RECIPES: Make your own delicious treats for the holidays with recipes from yourfavorite Whoville characters. WHO SCHOOL: This featurette includes a behind-the-scenes look at how the cast was transformed into citizens of Whoville through training with choreographers and stunt artists. SEUESSIAN SET DECORATION: Jump into the magical world of Whoville and learn how set designers managed to stay true to Dr. Seuss’ magical world. VISUAL EFFECTS: The artists explain how the team developed a whole city and digitally enhanced entire scenes through the use of visual effects. MAKEUP APPLICATION AND DESIGN: The artists and actors behind the creation of the characters discuss the methods in which it took to produce such unique and wondrous aesthetics. BY THE NUMBERS Numerical statistics on what props, appliances, crew, and decorations were actually needed to make the film. SPOTLIGHT ON LOCATION: A featurette on the making of the film with cast and crew including amazing behind-the-scenes footage! Rating: PG for some crude humor.